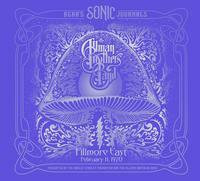 These Sonic Journals comprise the complete source material for the compilation Allman Brothers Band, Fillmore East February 1970, which included performances from February 11, 13, & 14, 1970. These recordings were not previously released in their entirety because they contain significant flaws, primarily due to reel changes in the middle of songs. It was Bear’s wish that they be released in whole because they are sonically pure and include important, previously unreleased material of the band with Duane in his prime, and so with the blessing of the Allman Brothers Band, they are available here for the first time. On each night, you can find something special and rare -- even if only in a fragment or a solo. Highlights include the three earliest known live versions of Elizabeth Reed.